Anyone who knows me well knows that I am a total weather geek! Driving into work Tuesday afternoon I was in awe at just how quickly the clouds developed following the sunshine we had earlier in the morning. The quick development of those cumulus clouds was due to a couple of factors. The first had to do with what was happening above our heads. There have been several 'mini' low pressure systems rotating around one large low over southern Canada the past couple of days. Each passage of the mini low causes air to rise in the atmosphere, forming clouds and eventually spotty showers. Second, temperatures in the middle of the atmosphere are very cool. As the sun heats up the surface of the earth, little tiny air parcels rise into the cooler section of the atmosphere. This rising motion helped create a little instability in the atmosphere, which in turn allowed showers to develop. If you looked closely at the clouds Tuesday afternoon you may have noticed they all had one thing in common: the bases of the clouds were all flat and appeared to be forming at roughly the height in the atmosphere. Ever wonder why that is? 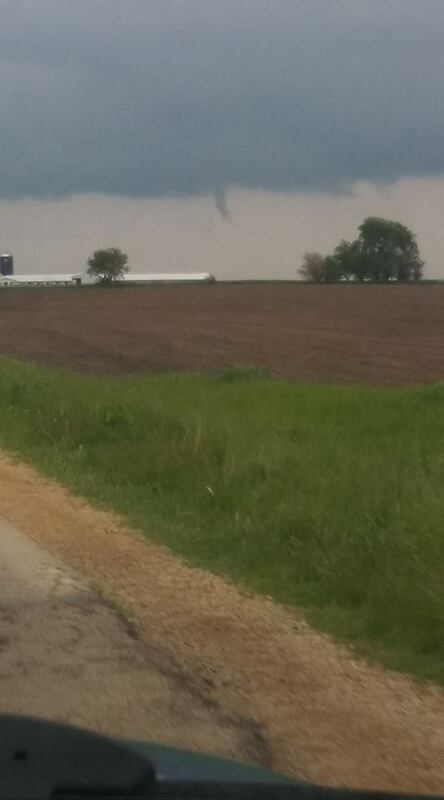 This picture from Ann Kenney in Scarboro, IL captures what's going on very well. Notice how the building cumulus clouds have flat bases to them at roughly the same height. This is a result of the air temperature and air pressure coming together at just the right point in the atmosphere to allow rising water vapor to condense and form clouds. As the sun heats the surface of the earth, tiny air parcels begin to rise. These air parcels carry water vapor with them. Water vapor is something we can't see, but is all around us - all the time. Once that air parcel reaches a point in the atmosphere, known as the LCL (Lifted Condensation Level), it becomes saturated and forms the cloud base. Because this point in the atmosphere is relatively uniform, the clouds appear to have their bases starting at the same height. After this occurs, the parcels of air become more buoyant and continue to rise allowing those puffy clouds to form. The more unstable the atmosphere is, the higher the cloud tops rise. Notice these clouds don't have a great deal of height to them, but just enough to produce those rain showers underneath the bases. Pretty cool! There is also another point in the atmosphere called the CCL (Convective Condensation Level). The CCL is usually higher up in the atmosphere than the LCL and is primarily achieved when there is no lifting mechanism in the atmosphere occurring. For example, there are no approaching fronts, dry lines or upper level features. Where the base of the cloud forms also depends on how dry or moist the atmosphere is. The drier the atmosphere, the higher the cloud base will be. The more moist the atmosphere is, the lower the cloud base will be. Seems we just can't catch a break this month with the rainfall. There have only been a handful of days in a row that we've had dry skies. Every other day, even if it was just a little, recorded rainfall. A few showers are popping up on radar Monday evening as low pressure spins over the northern Great Lakes. And until that low leaves, the rain chance continues. We'll see the threat for widely scattered showers develop again Tuesday afternoon and evening. Coverage may be a little more than what occurred Monday afternoon. But the rainy month has not only affected northern Illinois, it's had a major impact on other states across the country. Earlier this month significant flooding occurred over the state of Missouri wiping out farmland, towns and major roadways. Just this past weekend flooding occurred in Branson, MO killing at least two with one person still missing. 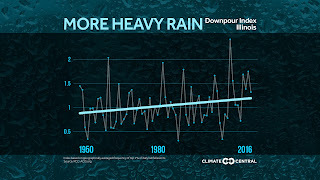 So, why have we seen such an increase in heavy rain events? One possible cause is climate change. According to Climate Central, for every 1°F of temperature increase, the atmosphere can effectively hold 4 percent more water vapor. Meaning as the atmosphere continues to warm, it's capacity to hold more water vapor and produce heavy rainfall is increasing. Climate Central also notes that Missouri is one of the states with strongest trends in heavy precipitation events. Locally, let's take the rain from this past weekend as an example. 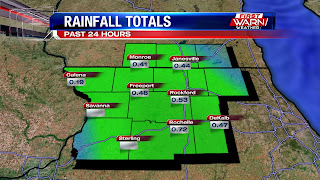 A line of non-severe thunderstorms rolled through early Sunday morning with the heaviest rainfall concentrated from central and northern Ogle County up to the state line. Rain reports of at least one inch, or more, were recorded. 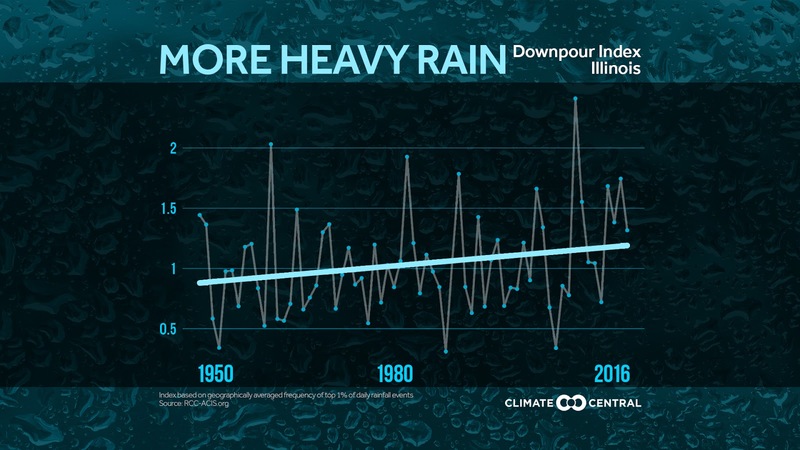 Looking back to the month of April, Illinois recorded its second wettest April on record - according to State Climatologist Jim Angel. Not only that, but three of the top five wettest Aprils since the late 1800's have occurred since 2011. Jim Angel also notes that the period January - April was the warmest on record for the state with an average temperature of 44.5 degrees, 5.4 degrees above normal. As we continue to experience a warming climate, the threat for heavy rain events will also continue. A stationary front will rest over Iowa and Illinois Thursday through Saturday. Gulf moisture will be pulled north with high pressure over the southeast. With little movement in the front, heavy rainfall is possible between Thursday evening and Friday evening. Some of those showers may even continue into Saturday if the front isn't pushed far enough south. I know I know...it's only Monday but it's hard not to start thinking about the weekend again. There are off and on chances for rain to start the week, and it looks like we will end the week the same way. The pesky upper level low that will keep cooler temperatures and scattered rain chances to start the week will finally be departing by midweek. An upper ridge develops west allowing heat to build and it tries to move east over the Great Lakes by Thursday. Our temperatures will warm into the low to mid 70's Thursday as a warm front approaches this will bring scattered chances late Thursday afternoon through Friday. The front stalls nearby and this will keep scattered rain throughout our Friday. Good news is, models are advertising the front to stall in central Illinois. If the front stays there through the weekend, that would keep the Stateline dry both Saturday and Sunday with high temperatures in the low 70's. We will have to keep an eye on the position of the front, if it wobbles more it will bring in a chance for rain on Saturday. So overall the week is book-ended with rain chances, but the weekend looks great! The comfortable weather from the weekend will carry over into Memorial Day with temperatures warming into the low to mid 70's under partly cloudy skies. An upper level low spinning north of the Great Lakes will be the focus for showers and thunderstorms over the Great Lakes and upper Midwest during the afternoon. Locally, a cool front will move through southern Wisconsin and northern Illinois during the day Monday. Limited instability ahead of the front will limit overall rain and thunderstorm chances, but a pop up shower and thunderstorm are definitely possible with the heating of the day Monday afternoon and early evening. There may even be a quick sprinkle before sunrise Monday. The feature in the atmosphere responsible for those showers is currently producing scattered showers and thunderstorms over the northern Plains and upper Midwest Sunday evening. As this 'mini' low swings southeast tonight and tomorrow, clouds will gradually build ahead of it, helping to produce an isolated shower or two during the day. The same happens Tuesday until high pressure slides in from the northwest late Tuesday evening and Wednesday. So for Memorial Day festivities, expect limited impact during the morning and only a slight shower/thunder chance during the afternoon and early evening. We had a nice start to the weekend with the sunshine and the temperatures in the mid 70°s, but now we've got some rain moving in from the west, currently going through Jo Daviess County. There were a few thunderstorms embedded in the rain earlier as the rain made its approach, but those storms are dying down. 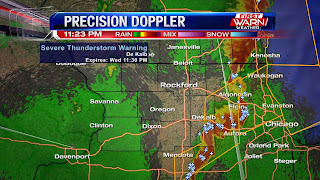 However, we can't rule out a few rumbles thunder for Jo Daviess while those storms die down. The rain is tracking northeast, but as it tracks northeast a few showers could skim our counties along the Wisconsin-Illinois border. The rain will move out between 9-10pm and we'll get a break from it during the overnight, before more rain moves in around 4am. The rain will start in from the west, with Jo Daviess, Carroll, and Whiteside counties seeing it first. Afterwards, it'll filter its way east into our other counties between 4-7am. A few thunderstorms are possible in Whiteside, Lee, and the southern portions of Dekalb as an upper-level trough will move in tomorrow morning. The dip in that trough will move in over central Illinois, which is where the instability will be highest. However, there will be just enough instability in our southern counties to allow for some thunderstorm development. All the other counties will see rain, with everything moving out around 4pm when the front moves out. After the front moves out, we'll see clearing skies for the evening with temperatures staying in the low 70°s. We hang on to these nice condition for Memorial Day, as well as for the rest of the week. It hasn't been the nicest end to the work week with all the rain moving through during the entire afternoon, but luckily that has now cleared out. We stay in the upper 50°s to low 60°s as we head through the evening, and we'll also see the clouds decrease. By the time we move into the overnight we'll have partly cloudy skies and temperatures in the mid 50°s. We get a break from the rain through tomorrow afternoon, but we'll have a chance for some thunderstorms starting in the evening around 6 when a low pressure system makes its approach from the plains. This low is what brought us the rain today, but as it moves closer it'll pull in more warmth and moisture into our area. This will be nice for most of the day tomorrow with partly cloudy skies and temperatures in the 70°s, but by the time we get to around 6pm we'll see those temperatures warm up even more with the approaching warm front, and this will lead to thunderstorm development. Most of the thunderstorms will develop to the west and southwest of the Stateline, mainly in eastern Iowa and along the Iowa and Illinois border. However, since that low will be tracking northeast, we could see a few thunderstorms move into our area during the evening hours. Furthermore, we'll see more rain occurring during the late-night hours and through the overnight as a cold front will pass through the stateline, but we could also see a few thunderstorms lingering along the front during the overnight as well. The front will move out Sunday morning around 7am, where we'll stay dry for the rest of the day with partly cloudy skies and temperatures in the mid 70°s. Along with that, we hang on to the dry and beautiful weather for the rest of the week! It will be a bit damp to kick off the holiday weekend, but not a total washout. Temperatures have been warming quickly this morning, and we will make it into the low 70's this afternoon. Rain moves in around noon to 1pm and will linger through about 5pm. A small but quick ridge moving through has keep some sunshine around this morning but as a shortwave rides along the ridge it breaks down and brings enough lift to support rain and even a few embedded storms. Most of this evening should be dry and the dry weather will last through Saturday with high temperatures climbing into the upper 70's. Periodic rain chances continue Sunday and Monday. Temperatures got a little late day boost as the clouds cleared just in time for a beautiful sunset! Highs this afternoon reached the upper 60's and low 70's. Still a little below average, but moving in the right direction. Most of the evening has been clear, but you may have noticed a little more cloud cover sneaking in from the west. This is due to an area of low pressure moving through the northern Plains. There have been a few light showers showing up over Minnesota and northern Iowa, but overall coverage of the rain has been fading with a weak ridge of high pressure over the Great Lakes. A stronger low pressure system moves in from the southwest Friday afternoon keeping temperatures in the low 70's, but also allowing for a few showers and thunderstorms to develop as early as Noon. Those showers will last through late afternoon with drier skies expected during the overnight. Most of Saturday, now, is actually looking dry with a warm front settling south over central and southern Illinois. A severe weather outbreak is possible over the south-central Plains and mid-Mississippi River Valley Saturday afternoon and evening. As the low moves closer to Illinois Saturday evening showers and thunderstorms will become possible before moving out by Sunday morning. Scattered showers and thunderstorms will be possible Sunday and Monday with the heating of the day. Highs will warm into the upper 60's and low 70's. It's been quite a gray week here in the stateline as we've seen 4 inches of rain alone in the month of May, which is about 1 inch above it's average. We've seen a meridional pattern in the jet stream, and this is what's been giving us all the rain. This causes low pressure systems to track northward and more slowly, causing them to stall over a given area. This low is now stalling over Indiana, which is why we've seen cloudy skies this morning. The low will begin to track more eastward once the jet stream flow starts to return to normal. The low will pull some clouds out of our area when it tracks east allowing for more sunshine during the afternoon, which will help bump our temperatures into the low 70°s. Another low will track into our area tomorrow, this one bringing in a warm front. The warm inflow will bring a chance for some thunderstorms tomorrow afternoon, mainly for our southern counties. However, this front will stall over our area during the weekend, bringing everyone in the stateline a chance for thunderstorms Saturday afternoon, but only a rain chance on Sunday. Sunday, the low will track north and begin to weaken, but once it moves out it'll pull cooler, drier air into our area. This will cool temperatures into the mid 60°s to start the work week, but more importantly it'll help clear our skies and keep the rain away. Both April and May have proved to be very rainy months. The cooler and rainy weather during April pushed back the start of spring planting and the excessive rainfall during the month of May caused some farmers to have to go back and replant some of their corn. According to the Illinois Crop Progress and Condition report from the USDA, farmers continued planting soybeans last week while some others went back to replanting corn. Corn planted in Illinois is at 89 percent, very near the 5 year average of 90 percent, while soybeans planted is at 48 percent. This week won't be the ideal week for fieldwork and many will have to dodge the raindrops to get work done outside. On average, the month of May receives just a little over four inches of rainfall. So far we've received roughly three and a half. Note: this does NOT include the rain that fell Tuesday afternoon. This puts us at a little over 0.80" above where we should be for this time of the month. Additional showers will fall overnight Tuesday and again on Wednesday. The overall coverage is expected to remain a little lighter than what it was on Tuesday, but it will continue to push our monthly rainfall total closer and closer to that four inch mark. We are actually beginning to enter into one of the rainiest periods for spring and summer with May being the third wettest month out of the year. June is typically our wettest month, followed by August. As the atmosphere warms it can actually hold a little more water vapor. The warmer the atmosphere, the more rain that can fall. It's also when we tend to get more MCS type storm clusters during the late evening and overnight. Severe weather was not in the forecast or expected to occur, but there were a few reports of small and brief funnel clouds over Iowa and northern Illinois Tuesday afternoon. Unlike an actual tornado, these funnels very rarely touch the ground or do any damage. They are actually very similar to 'cold air funnels'. Cold air funnels occur from weaker circulation occurring in the atmosphere several thousand feet above the surface of the earth. They tend to form in a cooler air mass, typically behind a cold front or when temperatures aloft are extremely colder than temperatures at the surface of the earth. 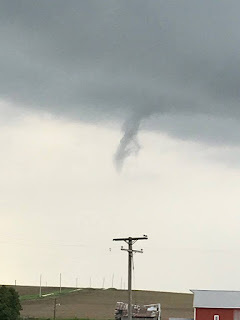 Sometimes there can be just enough circulation throughout the atmosphere to produce these funnels. And if the air is moist enough, like it was this afternoon with the rainfall, a condensation funnel will be visible. 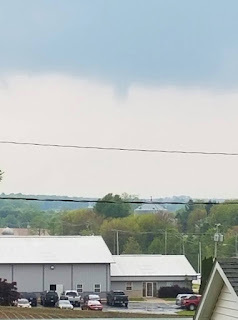 Here are a few photos of the funnel clouds we received earlier today from Rock City and Davis. Showers and thunderstorms have developed mostly over southern Wisconsin this evening with reports of pea sized hail and a few stronger (mostly to 40 mph) wind gusts. Most storm activity through the evening will remain north of the state line, leaving the majority of northern Illinois dry. An upper level low, otherwise known as a shortwave, is moving into northwest Iowa. Ahead of this feature there was just enough sunshine this afternoon to produce some instability in the atmosphere to allow for a few showers and thunderstorms to develop. Wind flow in the atmosphere is mostly from west to east, so anything that does develop out west will move east into Wisconsin. There is a thin line of showers over central Iowa, but current indications suggest this band will fade away before reaching northern Illinois and southern Wisconsin this evening. 'Gloomy' and 'soggy' would be perfect terms to sum up the weekend we had, with mostly cloudy skies and temperatures stuck in the low 50's Friday and low 60's Saturday and Sunday. We picked up about a half inch of rain on Saturday and as we go through this week and into the weekend, there is the potential for another inch to inch and a half possible for northern Illinois and southern Wisconsin. Today, the best chance for will be later this afternoon, but there is a slight chance for a light shower in the late morning. Sunshine and an incoming low will help to generate a bit of instability this afternoon, which could fire up a few showers and storms this afternoon and evening. A few gusty storms will be possible mainly from Freeport and west, with a marginal risk for strong to severe storms. There could be gustier winds and small hail as cold air moves in aloft. Tonight and into tomorrow the low will sink south overhead and will keep the chance for rain for Tuesday and into Wednesday before the low moves east. It won't be a washout this week, with mainly intermittent shower chances through the middle of the week. The pick day this week would be Thursday with high temperatures very close to 70° with mostly sunny skies. Rain chance increases Friday and into the weekend. We haven't exactly started the weekend the way that we wanted to, but at least our severe weather risk has been dropped. The areas of stronger convection have shifted to the south, where there are areas of higher dew points and stronger instability. Also, winds are pulling to the northeast, which means that the storms that form in southern Indiana and western Kentucky will track northeast and not move through our area. However, we can't rule out lingering rain and a few rumbles of thunder yet as a cold front will move through our area. Substantial moisture has been moving through our area today, which is why we saw the light rain earlier today. With this lingering moisture the incoming front can lift it and create more showers, but it won't be strong enough to sustain any thunderstorms. Thus, only a few rumbles of thunder are possible instead of a full-blown thunderstorms. The rain/thunder chance will cease between 10-11pm. As we head into the end of the weekend that cold front will cool our temperatures into the upper 50°s for Sunday and we'll hang on to the cloud cover. However, once we get into Monday, a high pressure system will form out in the plains and track east. It'll stay south of us while it tracks east, but this will allow it to pull in warm and dry air from the southwest. This will clear our skies for Monday, and also warm our temperatures back up into the low 70°s, so we're looking to have a great start to the work week. The only thing is that we cool down again after that. Why will the temperatures fluctuate so much? An upper level trough will tilt, leading to another high pressure development, this time over the Rockies. The high, combined with the low that brought the rain today that'll stay up north, will channel cooler air into our area and bring down our temperatures into the low 60°s for Tuesday and Wednesday. We'll see some light rain to start the afternoon on Tuesday, but after that the weather stays quiet for the rest of the week. We'll hang on to the clouds through Wednesday, but more sunshine will be seen by Thursday and the end of the week. Another low will form out in the plains by next Thursday, which will help to warm our temperatures into the mid to upper 70°s to close out the week. We've had a little bit of a rough week with the severe weather on Monday and Wednesday, and sadly we didn't get to end the work week much better with a rainy afternoon and colder temperatures in the upper 40°s. The rain cooled off our temperatures and kept them from breaching 50°, but luckily our temperatures are not looking to cool down much more through the overnight as we'll be in the mid 40°s. However, more rain will move in around 4am, and then some elevated thunderstorms will accompany the rain around 7am. A low pressure system is in place in the plains, which has brought a warm front towards our area, thus the rain. The front will pass through late tomorrow morning giving us a few breaks in from the storms, although we'll still see some rain in those breaks. As we move into the afternoon, temperatures will warm up into the mid to upper 60°s. This inflow of warm air will help to re-fuel the thunderstorms and make them stronger, which is why we are under a Marginal Risk for severe weather tomorrow. The stronger storms will form in southern Illinois, where strong winds and large hail is expected. The storms will track north after they form, but they will weaken a little as they move into our area. However, we can't rule out hail quite yet even though these storms will weaken because while the storms are weakening, there could still be a little bit of hail leftover which could fall into our area, most likely quarter-sized. The storms will move out around 10pm when the cold front passes through. The front will cool our temperatures into the upper 50°s for Sunday, but there will still be a good amount of moisture which will keep the clouds around. By Monday we'll see more sunshine during the day and temperatures return to the 70°s, but more rain will move in during the late-night hours. The rain sticks with us through Tuesday, cooling our temperatures down into the upper 50°s to low 60°s through Wednesday. There's a small chance for rain Wednesday afternoon with more thunderstorms moving in for Thursday and Friday. However, by Friday, our temperatures will rebound into the upper 70°s. High temperatures Friday will make a drastic drop from the highs we've had the past several days. Since last Saturday, high temperatures have been in the low to mid 80's. Thursday was a little cooler, but right near average reaching the mid-70's. High temperatures Friday may struggle to even make it out of the 50's during the afternoon! A passing cold front Thursday night will be pulled back north as a warm front Friday afternoon. That front will stop short of northern Illinois during the day. Highs south of the front over central and southern Illinois will be in the 70's, or warmer. Highs north of the front will be in the 60's, with middle to upper 50's expected over northern Illinois and southern Wisconsin. Temperatures a couple thousand feet above our heads, however, will be warming quite a bit. Unfortunately that warmth doesn't quite make it down to the surface and will actually help keep cloud cover and even a little fog around through the evening. By Saturday low pressure will be moving into northeast Iowa and should pull the warm front into southern Wisconsin. This would push high temperatures Saturday afternoon back into the 70's. The Chicago National Weather Service traveled to McHenry and Boone counties to survey damage from Wednesday night's thunderstorm. From the survey they did find damage consistent with an EF-1 tornado from just south of Poplar Grove northeast to Harvard. Maximum winds were estimated between 90-95 mph with the tornado on the ground for a little over 10 miles. 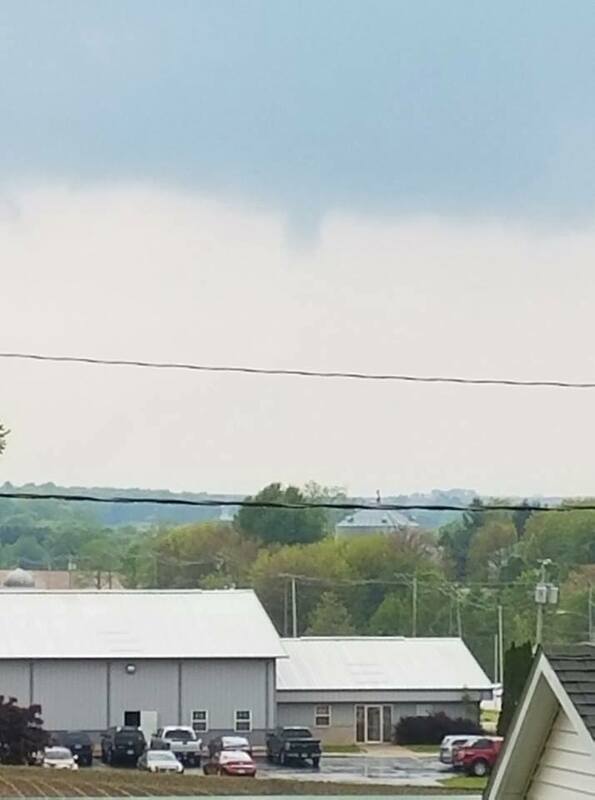 The tornado went right through the town of Capron producing significant damage to a farmstead. No injuries or fatalities were reported. 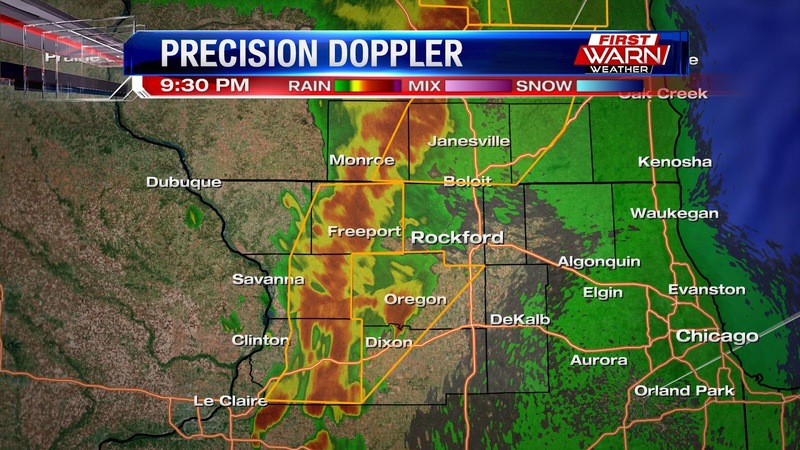 11:23pm Update: The worst of the severe weather is now east of Rockford. There is still a Severe Thunderstorm Warning for DeKalb and McHenry counties until 11:30pm, but soon the storm will be moving towards Chicago. (10:48:00 PM) nwsbot: Local Storm Report by NWS LOT: 2 N Capron [Boone Co, IL] emergency mngr reports TSTM WND DMG at 10:28 PM CDT -- numerous trees and power poles down in capron on hunter road. pedestrians are stuck in cars. no injuries were reported at this time. (10:42:15 PM) nwsbot: Local Storm Report by NWS LOT: Poplar Grove [Boone Co, IL] 911 call center reports TSTM WND DMG at 10:24 PM CDT -- numerous trees and power lines down in poplar grove and Caledonia. 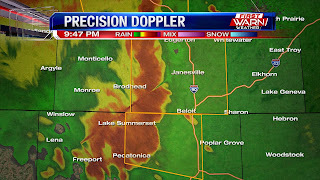 (9:38:36 PM) nwsbot: Local Storm Report by NWS LOT: Pecatonica [Winnebago Co, IL] trained spotter reports TSTM WND DMG at 06:15 PM CDT -- numerous mature trees snapped and uprooted. some are 4 feet in diameter, and some are on power lines. power poles are also down, and a 10 ft by 8 ft chicken coop was blown into a nearby field. pea sized hail was also reported. (9:16:28 PM) nwsbot: Local Storm Report by NWS MKX: 3 E Argyle [Green Co, WI] law enforcement reports TSTM WND DMG at 08:34 PM CDT -- six trees down. Another summer-like afternoon on tap for Wednesday, but this time storms are in the forecast. As mentioned in the previous post, mid-May is when we enter peak severe weather season for northern Illinois and southern Wisconsin. A strong low pressure system will develop in eastern Nebraska in response to a trough or dip in the jet stream in the upper levels of the atmosphere. This along with increasing jet wind/strength over eastern Iowa brings the threat not only storms, but the potential for strong to severe storms. More 'ingredients' are coming together to support stronger storms from Iowa east into northern Illinois. Once the atmosphere's 'cap' is broken, storms will develop over Iowa and Missouri and quickly move to the northeast. We want to watch for storms to approach the area and move through around 3-10pm. These storms will be fast movers with the potential for heavy rain, hail, strong wind, and even an isolated tornado. The hail threat is enhanced a bit more with strong updrafts and downdrafts possible. If storms stay in a super cell mode, the tornado threat would go up, while if they form into a line, strong straight line winds will be a concern. While severe storms are not certain, it is a good day to stay weather aware and have multiple ways to receive watches and warnings should we get them! We all know severe weather can occur at any time and during any month of the year. But we are beginning to enter into northern Illinois and southern Wisconsin's peak severe weather season, which is mid-May through July. Following a bout of severe weather Monday afternoon and evening, Tuesday brought a refreshing, but warm, break from the active weather. That will be changing Wednesday with a storm system currently in the southwest that is expected to move into the Midwest by Wednesday afternoon. Severe thunderstorms have been ongoing over Minnesota and Wisconsin to the north, and over the central and south-central Plains. This is where the position of the jet stream lies. The strongest winds within the atmosphere are located over the upper Great Lakes and over the Plains, while a dome of heat has developed over Illinois and the Gulf states. This heat dome has pushed the jet stream north, leaving skies clear over most of northern Illinois and southern Wisconsin. The severe threat remains to the west overnight Tuesday, but will ramp up for parts of the Midwest Wednesday afternoon and evening. Low pressure responsible for the ongoing severe weather in the Plains will lift northeast into western Iowa by mid-morning Wednesday. There could be a few showers and thunderstorms, non-severe, ongoing Wednesday morning over northern Illinois and southern Wisconsin but should move out by early afternoon. 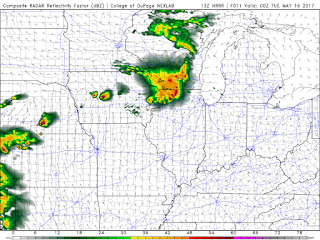 Strong to severe thunderstorms are likely to develop over northern Missouri and southern Iowa by early afternoon with the arrival of the low pressure system. As the low moves into north-central Iowa by late afternoon Wednesday, thunderstorms will be moving into eastern Iowa and possibly western Illinois after 2pm/3pm. The highest risk of severe weather will be closer tied to where the surface low is located and where the highest winds within the atmosphere reside. Large hail, damaging winds and isolated tornadoes are all very well possible with the initial development of thunderstorms to the west. As this line moves further east into north-central Illinois the threat will transition to more of a hail and wind threat. Timeline of storm development will be from roughly 2pm to 10pm Wednesday. Make sure you have a way to receive watches and warnings Wednesday and remain alert to changing weather. 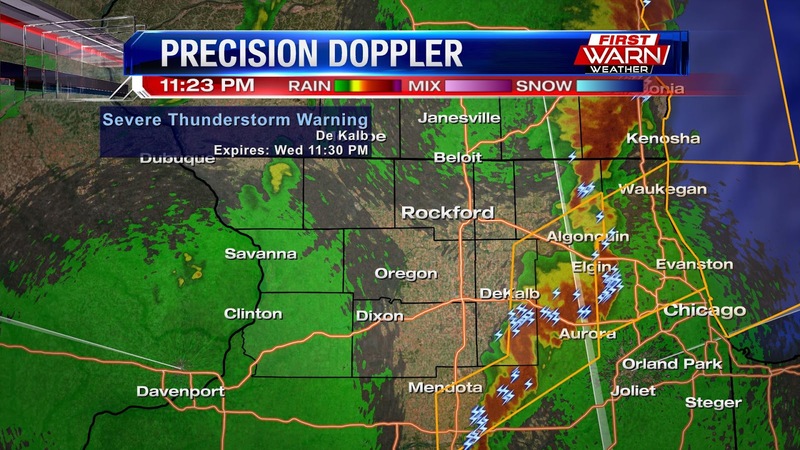 It was a rocky night for some yesterday with a couple rounds of storms that moved across the Stateline. The first round brought quite a bit of hail to Machesney Park, Loves Park, and north Rockford. Hail reports range from 1-2" in diameter, which caused some hail damage to cars in the area. 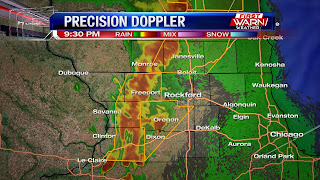 Severe Thunderstorm Watch has been cancelled for Jo Daviess and Stephenson counties. Heavy rain producing thunderstorms continue to move east out of Winnebago County and into Boone County. While the high wind threat has decreased, wind gusts close to 40-50 mph are possible. A Severe Thunderstorm Watch has been issued for most of southern Wisconsin and most of northern Illinois. Numerous Severe Thunderstorm Warnings have been issued with a line of strong thunderstorms moving into south-central Wisconsin and north-central Illinois. The northern extent of this line...north of the state line...has the greatest threat of producing strong to severe winds with reports of wind damage back to the west. 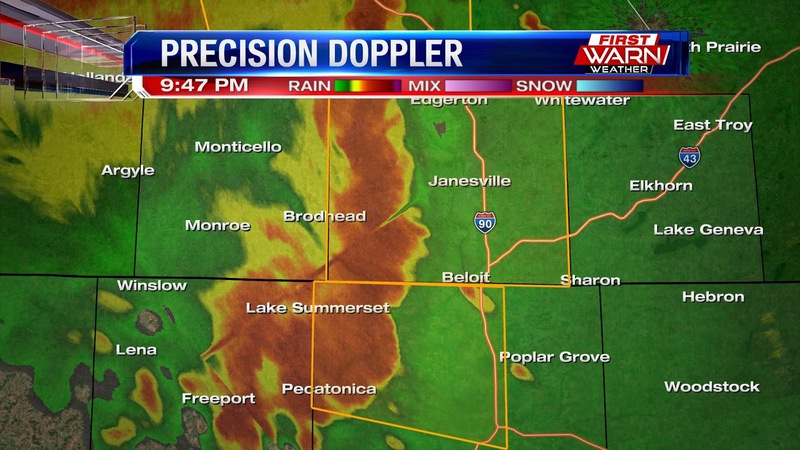 Further south, there have been very few wind damage reports from Jo Daviess and Stephenson Counties, however, a slight forward movement of these storms is very well possible. (9:14:35 PM) nwsbot: Local Storm Report by NWS DVN: Apple River Canyon Stat [Jo Daviess Co, IL] law enforcement reports TSTM WND DMG at 08:57 PM CDT -- tree down on east canyon rd. delayed report, time estimated. (9:28:50 PM) nwsbot: Local Storm Report by NWS MKX: Monroe [Green Co, WI] public reports TSTM WND DMG at 09:10 PM CDT -- couple trees down. (9:28:04 PM) nwsbot: Local Storm Report by NWS MKX: 5 S Browntown [Green Co, WI] public reports TSTM WND DMG at 09:02 PM CDT -- tree down. The summer-like trend will carry over from the weekend and last through midweek. We made it to 83° Saturday and 82° on Sunday, but the warmest day this week will arrive on Tuesday. But the summer like weather will bring the threat for showers and storms in the early evening. A stalled boundary currently in central Illinois will lift across northern Illinois this afternoon, in response to an incoming low pressure in the plains. This brings a chance for rain and storms to ride along the front, combining with areas of energy and lift that ride along a ridge over the area. However, with the placement of the front, the best coverage in storms will be in Wisconsin and along the Wisconsin stateline but also south through Rockford. That area is also where there is an enhanced risk for strong to severe storms. A slight risk encompasses our far southern counties. In storms later today, we're watching the threat for heavy rain, strong wind, and even potentially hail in this MCS system. Best timing would be from the late afternoon and early evening, or between 4pm-10pm. A string of 80 degree warmth will make it feel more like the beginning of summer rather than the middle of spring. Following the weekends warmth of the low 80's, temperatures will warm into the upper 70's and low 80's Monday afternoon. Following a warm front Monday night, temperatures will really warm Tuesday afternoon pushing highs into the mid and upper 80's! Right now I'm forecasting a high of 86 degrees Tuesday afternoon. Rockford's record high is 90 degrees set back in 1992. Looks like we'll be very close to that Tuesday. It's been an absolutely beautiful weekend! Highs both Saturday and Sunday topped out in the low 80's, nearly 10 degrees above average! Temperatures Sunday late afternoon, though, fell rather quickly over just a couple hours span. This is because a lake breeze from Lake Michigan was pushed this far inland. Saturday night a cool front came down the lake, but was pulled back north Sunday afternoon. As it usually is this time of year the warmth didn't quite make it to the lake shores. As a result, a lake breeze developed. And a pretty strong lake breeze at that. Winds have shifted around to the east and will remain from the east through the night. By Monday afternoon, temperatures will once again be nearing 80 degrees with a developing warm front. With the passage of the warm front, there is a chance for thunderstorm development late Monday afternoon and evening. The warming trend has shot up quite a bit, as our temperatures have climbed nearly 10° from where we were at yesterday. We officially hit 80° today, and even got a little past that. Along with that, we flew by our average today as we started the beginning of this week well below it. The best part is that we get to experience the 80° temperatures with the sunshine! It's been a beautiful start to the weekend, and Mother's Day will be the exact same with sunny skies and temperatures in the low 80°s. However, you'll want to experience the nice weather this evening has to offer first, as we'll hold on to the sunny skies and see temperatures in the low to mid 70°s. Be sure to make plans tonight, because this is an evening you won't want to miss. The reason for this strong warmup is that we have a high pressure system moving south of us. Since the high is south of us, it's able to pull in hot and dry air from the southwest, which is helping to keep our atmosphere dry and our temperatures very warm. Thus, we get sunny skies and temperatures well above average. We hold on to these warm temperatures through next week, although a low pressure system will begin its approach on Monday. This will push the high pressure system further south, which will end up increasing our cloud cover. The low will develop some strong thunderstorms with these warm temperatures, but the good news is that the strong storms will stay to the northwest. However, we could see a few small thunderstorms filter through our area Wednesday evening, but other than that this low will help to keep our temperatures in the 80°s. That low will pass on Thursday, bringing back the clear skies to go along with the 80° temperatures. A second low will move in to replace it on Friday, bringing us a chance for a few thunderstorms in the evening and a chance for some light rain Saturday morning. What a great way to spend our Friday; sunshine and 70° temperatures! Even better, we get to see even warmer temperatures for the weekend and keep the sunshine. We've seen a warming trend this week that's going to be ramped up this weekend, all thanks due to a high pressure system to our west. The high is helping to keep our weather calm and our skies fairly sunny, but by Saturday night it'll position itself south of us. This is key because in this position, the high will be able to pull in lots of warm air, which will help to bring our temperatures into the upper 70°s for tomorrow, but a few of our southern counties could see 80° tomorrow afternoon. However, everyone will be seeing temperatures in the low 80°s for Mothers Day and we'll hang on to the sunshine for that day as well, so be sure to make some outdoor plans that day because it will feel like summer. As we head into the work week we'll keep the 80° temperatures and sunshine for Monday, but we do have a chance for some thunderstorms Monday evening as a low pressure system will move in and strengthen that inflow of warmth and moisture into our area. The clouds will stick around on Tuesday, but the low will help to keep our temperatures in the 80°s for the afternoon and for Wednesday as well. Wednesday evening we'll have another chance for some storms, but the weather will stay calm for the rest of the week afterwards, with temperatures slightly cooling into the mid 70°s for Thursday and Friday. Temperatures Thursday warmed into the upper 60's and low 70's. Rockford reached 70 degrees for the first time in the month of May. The warming trend will continue into the weekend, with most of the weekend staying dry. However, I'm holding on to a very small precipitation chance Friday and Saturday because of the placement of the jet stream overhead. A ridge of high pressure will begin to move east for the start of the weekend. Underneath that ridge, temperatures are expected to continue their climb, possibly reaching the middle to upper 70's on Mother's Day. Friday and Saturday, northern Illinois and southern Wisconsin will be on the outer edge of the jet stream providing the warmth. Think of the jet stream as an 'interstate' for storm systems to travel along. If we're close that interstate, we run the chance for storm systems - weak or strong - to move through. This will be the case the next couple of days. Several weaker low pressure systems will move along the flow in the jet stream. As the low approaches, air from the surface will begin to rise. Rising air, if conditions are just right, induces precipitation. But if we look at the whole atmosphere going into the weekend we'll find a decent amount of dry air down near the surface. If precipitation were to occur, there would be a good chance that it would evaporate before ever reaching the ground. Outdoor plans today? You'll want to keep an eye on the radar, with the threat for storms going up late in the afternoon. Can't rule out an isolated shower or two through the early afternoon, but heavy rain and storms are in the forecast for the late afternoon. 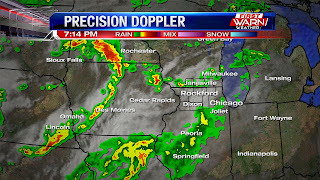 We're watching an area of low pressure currently situated in southwest Iowa, with it's warm front in central Illinois. 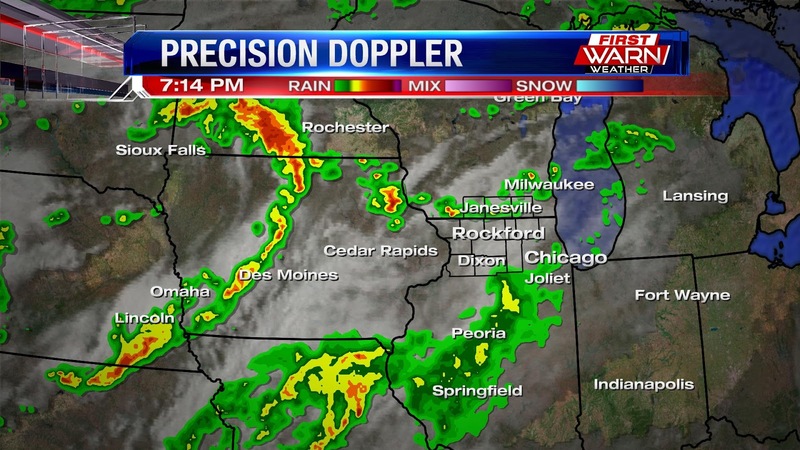 The low will strengthen and move east, which will lift the warm front farther north and closer to the Stateline area. This will prompt showers and storms to develop and move in from west to east. The timeline right now to expect storms would be around 4pm through about 10pm. For the Stateline, most of the area is under a marginal risk for strong to severe storms, while our southwestern counties are included in the slight risk. Overall, we'll want to watch for storms with heavy rain at times and even some hail, as our storms remain elevated north of the front. Closer to the warm front is where the threat is higher for strong to severe storms. South of I-80 is the area that will be closer to the approaching warm front, and area of low pressure. Therefore has a higher likelihood of stronger storms. Rain amounts will total between .25"-.75", but localized higher amounts possible in thunderstorms. Most of the rain will be out of the area around midnight, though its possible for a passing shower into Thursday. A lot of the rain is winding down for our Tuesday, but not before it dropped a good amount of rain across the Stateline. Initial rain totals coming in show a little under a half an inch of rain in southern Wisconsin, about a half an inch in Rockford and Freeport, and three-quarters of an inch in Rochelle. There will be some ponding on the roads this morning as we slowly dry up today. Another round of rain will be possible on Wednesday too, as another low pressure develops in the plains and slides east into Iowa early Wednesday. It will lift the boundary that will be positioned in southern Illinois back north later Wednesday afternoon. This will then prompt showers and a few rumbles of thunder for the second half of our Wednesday, which then has the potential to add on another half to three quarters of an inch of rain. Along with periods of rain over the next couple of days, there will be quite the temperature difference across Illinois and Iowa. North of the front today, northern Illinois and southern Wisconsin remain cooler in the mid and upper 50's and low 60's. However just south of us near the Quad Cities, high temperatures will climb into the 70's. On the southern side of the front in southern Iowa and northern Missouri, high temperatures will climb into the 80's. Unfortunately there are no 70's or 80's in the forecast as of now, but models are hinting at warmer temperatures by the start of next week. We'll remain on the 'cooler side' of storm systems this week with low pressure over the East Coast blocking warmth from making it into the Great Lakes. Illinois as a warm front moves closer. 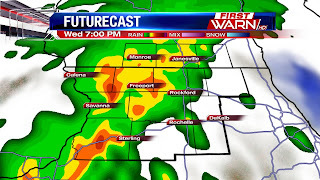 The warm front falls just short of passing the Stateline, but will become the focus Monday night for the development of showers and thunderstorms. The amount of moisture in the atmosphere will increase with the arrival of the low and this could lead to bouts of heavier rainfall during the overnight. 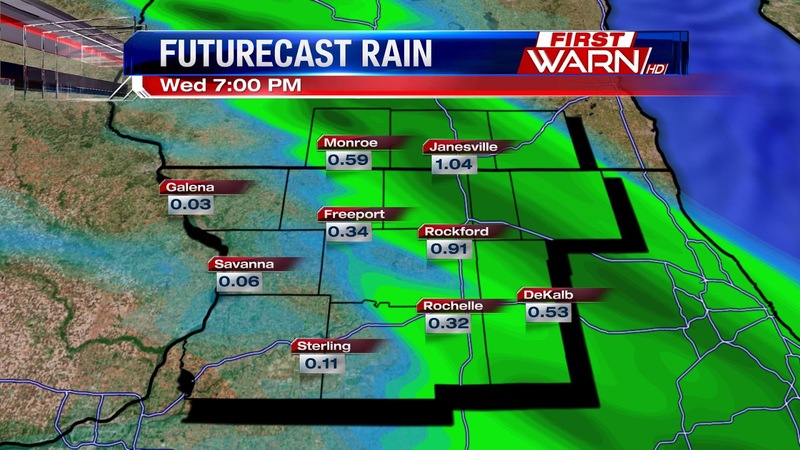 Rain totals won't be uniform throughout the Stateline, and we'll likely see a wide range of amounts by Tuesday morning. Areas most likely to see the highest rain totals will be from Janesville down to Rockford and to the east. 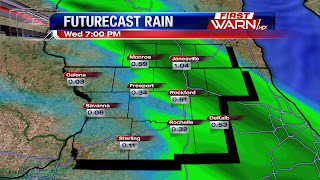 Rainfall totals could add up to over an inch with repeated rounds through Tuesday morning. Further west rain totals would be drastically lower.